I realized it had been ages and ages since I wrote you last. I hope that you are well and the company has had a lot of (safe!) work to keep you busy. Are you still digging graves, too? I never imagined that I would write a such a sentence as that, but there you go! You are an eclectic man. Have you climbed any good cliffs lately? I, unfortunately, had a terrible fall a bit ago. It was before the battle near Minas Tirith. I was on a roof at the Tower and I fell. Luckily, I was not dead and they found me and Miss Cirieldis took care of me while I recovered, but sometimes I wish . . that I had more things to do than stare out of the window. While I was laid up in bed. Something terrible has happened, but I don’t really want to talk about it. At least Father is not dead as the reports originally said. I have moved in with him, with Hathlafel. He still wants me as a daughter even though I am not his and I cannot be more thankful for that. Without him, I feel like I would truly have no family anymore. Sirifast, his brother, is tending to the house he bought. It is in my name. It was kind of him to do that for me, but I don’t know what to do with a house I cannot live in. Did you meet Sirifast? I cannot recall if you ever did. Oh, Miss Ciri also helped me to get out of working for you-know-who. Another girl, one “trained” for such work, took my place. I cannot help but feel terrible that another girl is doing that and because I couldn’t. It nearly destroyed everything before the Swan-knights left for Minas Tirith. So, you see, it really had been forever since I had lived in that house. I lived at the Tower instead. It’s so empty now. Surely there is a fine layer of dust over everything. Is it wrong of me that I wish to sell the property? I wish to forget everything about that bit of my past because it hurts too much and to see his remaining family hurts too much and I should never have married him in the first place. Romantic relationships outside the order complicate things. Roses aren’t supposed to marry. Miss Cirieldis doesn’t think that way. She is in love with Sir Aureldir. Sometimes I remember that I once believed he was my father and it seems like so long ago. This is turning into something quite unlike what I had intended. I’m sorry for not staying very well on topic–Hello, Hallem, how are you, Hallem, I am well, Hallem. That sort of thing. I just miss you so much and there is so much to say and I don’t really want to think about any of it, really, but I should. I need to talk to people, don’t I? I need people to help me remember the world has good in it still. That it isn’t just murders and kidnappings and lies and death. Do you remember Lord Claur of House Baudh? He was injured recently and I have been helping him with his research. It was a nice diversion while my own injuries kept me from being able to work as much as I wished. I am mostly recovered; I simply cannot waltz back onto the ship full stop so soon. It would raise suspicions. He is a nice man, Claur. I enjoyed working with him. He took the time to hear my thoughts about his topics and it felt good to have someone listen to me. This is probably too long to be a proper letter. I hope life in Bree is good. Please write me back. I miss you. One by one with each rising sun. Maybe, just maybe, you can breathe again. She rolled the paper into a tight little scroll and sealed it up with wax. She chose the bottle with the shoulders and slid the letter inside. She waited until dark because it was easier that way. The fewer people that saw her, the fewer questions she might have to face. How did you get up so high? What are you doing on that ledge? Aren’t you afraid you’ll fall? I have fallen once, she told them in her head, and I should have died then. I wish I had died then. But they didn’t see her move through the shadows, or if they did, they told themselves it was just the light playing tricks on their eyes. Old eyes in the candle light. Young eyes full of imagination. She stood on the ledge where she hid so long ago after fleeing from her only home, the Ivory Tower. The Keep of the Swan-Knights loomed in the moonlight and she wished that it was only guard duty that kept him away. The bottle, hard and cold in her hand, glinted, gave her intentions away if anyone cared to look. Did anyone care to look? With all of her strength, she threw the bottle with the rolled up letter and it sailed in the starlight, through the air, and splashed into the waters below. Every night the ritual was the same since she moved to her father’s house. People kept journals all the time, of course. Letters were normal to send to loved ones. Arameril shared her journal, her day, with her loved one, and since no post could carry the words to him, she prayed to Elmeleth that they would find him through her offering to the sea. Thank you for your letter and for the money. I will see that your sister gets it as soon as I can, though I am afraid of what will happen when I take it there. I would send it with a messenger, except I would not risk it going astray. Therefore, I must swallow my worries and simply face your sister regardless of what she may think of me now that she probably knows I am not really your daughter. I am glad that you are safe for now. What little time I do get to sleep is usually spent lying awake worrying about you and Pengail. It is so lonely here without the both of you. I wish that Pengail had not said anything. I fear he spoke only to hurt you for you knowing will do no one any good. Pen and I had reconciled as much as we possibly could in the week before he left, and I told him that Scarlet let me go. She let me off work for that week and I would that he keep believing that to be the truth. He cannot know that I am still working to bring her down because someone must. If not me, then who? She has hurt you and she has hurt others and someone must put a stop to it. If you believe Miss Cirieldis can assist me, I will talk to her. But I will not stop until Scarlet has been handled. My life is my city’s and I will rid her of this blemish. As you would protect me, I will protect you. I miss you terribly. I do not like being at home alone without you, so please come back. I do not know what else to say. My world is praying for your safety and the safety of Gondor. I love you, Pengail. Some say the crow’s nest was a punishment. The toss and the turn of the sea often was enough to make a seasoned sailor spill his guts at such a height. 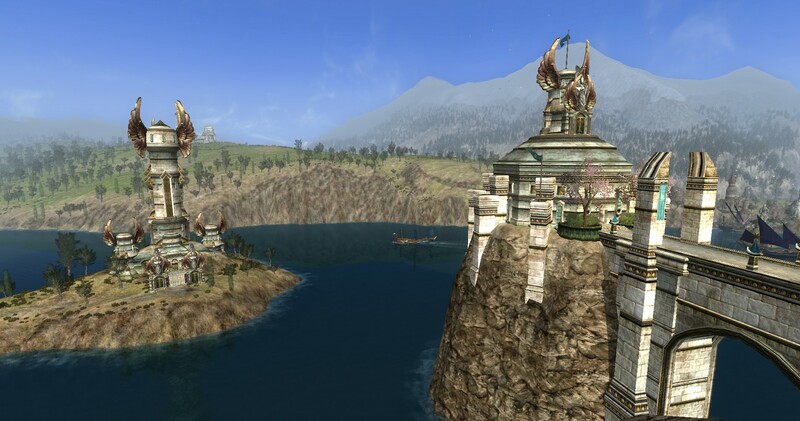 But Arameril did not feel nauseated as she leaned over the rail of the little platform to scan the surrounding waters for the prize. The spray from the whale’s exhale reached her all the way up at the top of the mast and Arameril giggled in a very un-sailor-like manner. Below her, tourists and citizens rushed to the left rail to see the giant animal for themselves as Scuppers ushered the more reluctant ones to the view. The sharp wind caught Arameril’s hair and she laughed as she held onto the rail lightly. Her feet were sure and adjusted to each roll of the ship naturally; she was born to climb the rigging and balance across tight ropes and sails and have the salt breeze on her skin. The other sailors knew her well enough from her frequent visits as a patron to know her true passion for the sea. Her transition from school girl to sailor went as smoothly as it could have. Salty Sal, the ship’s captain, ensured that she did not hear any off colour comments, at least. Though if she had heard any, she had several comebacks prepared. It helped that when the captain had ordered her to to top of the mainsail on the first day aboard, she beat the other men despite the strong wind that necessitated the refastening of the rope that had come loose. She heaved and hoed with the strongest, and if they marveled how such a petite little thing could lift so much, they did not ask. She wondered if they remembered the trial. Still, her life was happy. She had what she wanted, and her father had made it so. Her only regret was Neneth was the one cooking for Pengail and washing his clothes. Soon, she would be able to use her wages to pay her fee and relieve her father of the burden. Pengail would be able to give up the second (and third) shifts, and they would be able to spend more time together. 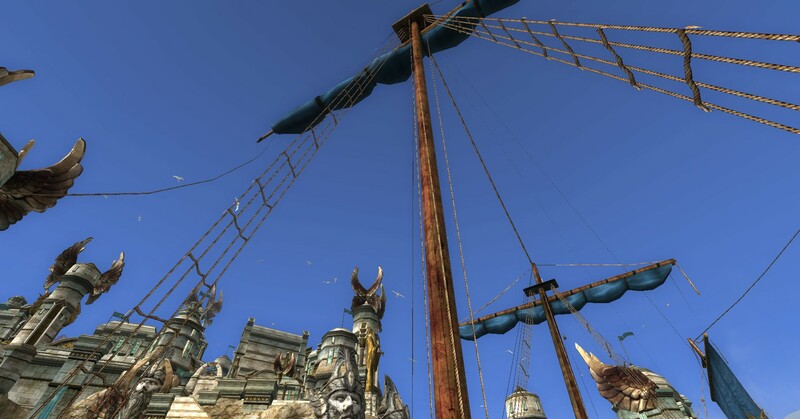 The ship began to turn back to the docks and Arameril smiled at the children rushing to the other rail to watch the city as they turned. Her city. And while the rumours of dark things stirring the past year grew with each passing day, she knew that her city would find its light as long as there were people to protect it. People like her Pengail. People like her. As the wind tossed her hair, she leaned over to watch over the docking of The Chipper Kipper. Already folks were lining up for the next tour. Once the ship was moored, she jumped lightly to a line and slid down to the deck below to laughter and light clapping. She helped people disembark with Scuppers. She greeted those coming aboard. She hoisted sail in open waters and climbed back to her perch and called out when she spotted a school of dolphins leaping in their wake. Arameril was content in the near perfection of the moment, and she relished every bit of it. I hope this letter finds you and your daughter well. 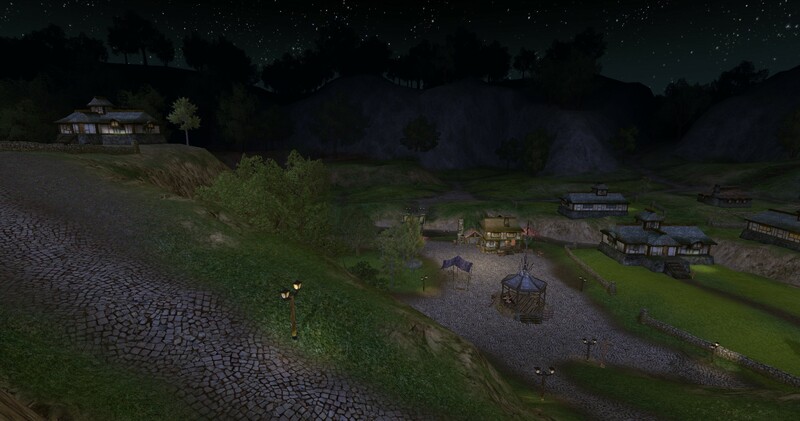 Things are quickly falling back into normalcy here in Dol Amroth. Is that how it always is after such turmoil? People just go through the motions of life until they actually feel alive again? I do beg your pardon; that is not a very cheerful way to begin a letter! I suppose for many, the entire affair was a tragic attack on the city itself and that made it less personal. And, ultimately, that is what it was unless your loved one fell in the battle. The walls can be rebuilt, the trees replanted. But for us, it was much more personal, wasn’t it? Our loved ones were not just in the line of fire, we truly knew what was at stake and that the Lady’s personal greed drove all the pain that fell upon the shoulders of the city that day. I still miss Lady Deludhae’s smile and her kind words of wisdom. I never knew how much I would miss them until now. I digress. This was supposed to be a happy letter! Pengail and I have set the date for our wedding and it is with great regret that I enclose our invitation only because I know you will not be able to come. Still, I wanted to send it to you to share with the Wayfarers because you folk are as close to me as any family I could have and dearer to me than any I could ask for. Know that as Pen and I say our vows, you will be in our hearts. If it would please you, do write back and tell me about life in Bree. There is a part of me that wishes my destiny had taken Pengail and me with you even now as we plan our life in Dol Amroth. For me the city will never be the same, but in the end, I love it still. Perhaps one day I will still get to visit the town and see for myself what the big hubub is about. I hope your Yule is beautiful and filled with love. It is thanks to you and Sir Arrowheart that I have mine. P.S. : Pengail says hello and thank you again for all that you’ve done for us! Greetings! How are things in Bree? Have you climbed anything tall lately? I hope the gear from the Prince has served you well. I miss having those little ropes and hooks to help me along. Not that I have much time to climb recently, not even the Tower! Pengail and I have set the date for the wedding and you would not guess how ridiculous I am being (or maybe you would). We are getting married before Yule! It will be a small affair with only those we love most and those we cannot avoid. I wish we were not so far apart and that you could come. and bring the rest of the Wayfarers, of course. I miss all of you very much. I have enclosed one of the wedding invitations we had made. Maybe think about us on the eighteenth and send us your warmest wishes, if you would. That would be the best wedding gift I can think of at present under the current circumstances. 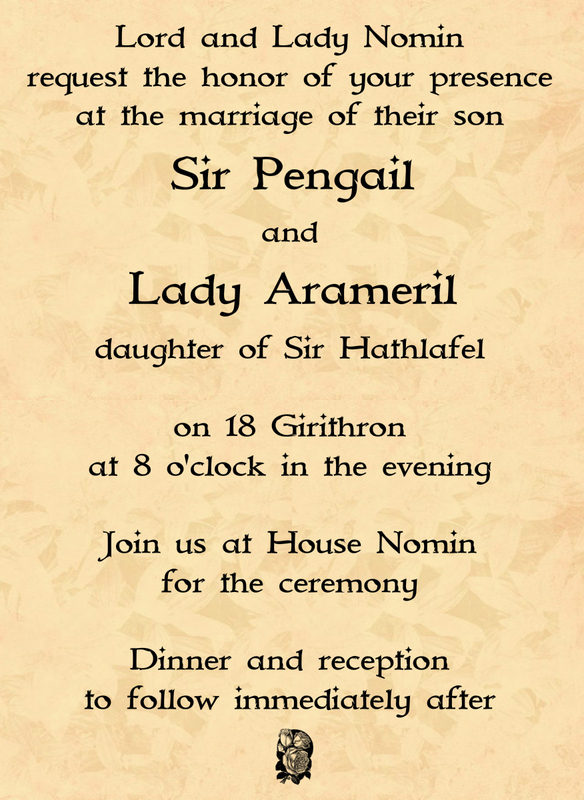 I hope that Lord Carmanadh and Lady Mredothyn will be able to attend. Pengail would both love that and be terrified to have the Knight-captain in the audience, I think. It’s not like he didn’t bleed all over the man’s mattress, though right? Well, not his mattress. That would be odd and I would highly question Pengail if that had been the case. I am laughing so hard I can hardly write! But I know I am just being silly. My father has been trying his hardest to find a place in my life. I am grateful for that, but he can be so awkward. And he certainly has a chip on his shoulder that creates a barrier to getting to know him. Lady Nomin, Pengail’s mother, invited him to dress shopping with us; I suppose any man would find that difficult to bear, but Hathlafel seemed so out of place there without his armour to protect him from the city’s scrutiny. I felt so sorry for him when he showed up in his homespun along the opulent street in the clothier’s district. Lady Nomin bought my dress for me as a gift, though I believe it was also to protect my father from having to find the funds to pay for it. It is a glorious dress, Hallem Kemp. Ha! I am writing as if you were a girl friend who would be interested in such things. Perhaps you would rather hear about the delicious menu we are preparing instead? That should make any man jealous! Not that I’m trying to make you jealous. The cooks at House Nomin are simply wonderful. In any case, I do hope you are settling into Bree again and that your Yule season is bright and full of love. Enjoy the barley candies I’ve sent! And give a few to Mister Mathdor for me, if you would. We did not get to say a proper good-bye and I owe him a great deal. P.S. 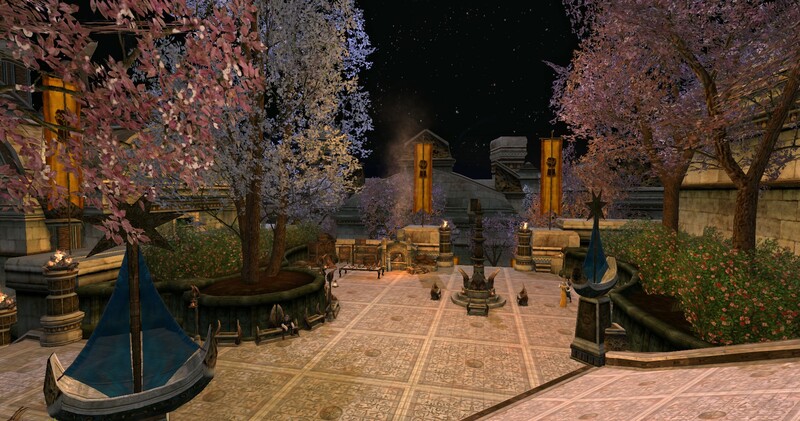 : Did Master Kemendin return to Bree? Lady Cirieldis said that he had to leave for about a month, but it has been longer than that. If so, I am cranky at him that he did not say good-bye! Is that an Elf behavior, not to say good-bye? If he’s there, tell him good-bye for me! The grounds of the Colagar estate seemed busy with the increased guard patrolling them. Arameril walked close to the windows as she traveled the various halls of the manor arm-in-arm with Pengail. At each window she would stare longingly outside as they passed. The clouds. The sky. Since Atanamir’s wards had been applied, she dared not touch even the sills to lean out to feel the open breeze on her face. Pengail slowed at one of the larger windows on the second floor of the sprawling manor. 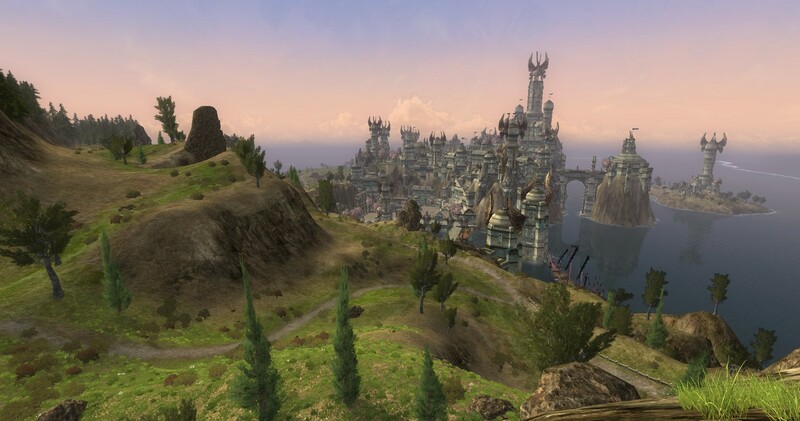 His long stride halted as Arameril gazed on the distant skyline of the city. “You know, Pen,” she said without turning to look at him, “sometimes, I do miss the Ivory Tower. I left on an errand and never went back. I knew I could not return to that place knowing the Orchid was being held captive there somewhere. Pengail returned the smile and led her to a bench in a recessed alcove where they could sit and watch the city from afar. Arameril leaned against his good arm. Her head barely met the middle of his bicep. Shaking his head, he said, “N-no!” His gentle eyes looked down at her with sincerity and urged her to continue. She nodded, her confidence in returning to the memories of her life in the tower growing. Arameril smiled as she rested her head against him. Her little fingers intertwined with his. Pengail shook his head. He tried to find the words to match his thoughts and she watched his eyes as he worked through it. Arameril reached up to lead his face down to hers. She kissed him tenderly. “I love you,” she whispered against his lips. “I love you.” He smiled and stood holding his hand out to her to help her to her feet. She turned to face the direction from which they came. Down, down the hall and around a left turn and then a right or two. Hathlafel’s room. Pengail squeezed her hand reassuringly. Smiling, Pengail took both of her hands in his and stood before her. They paused in front of a wide window overlooking the coastline. Arameril held his hands as an anchor as her brow worked through her thoughts. Arameril stood on tiptoe and still had to wait for Pengail to stoop to bring his lips to hers. I just needed a little perspective. To see what the Swan-knights were going through. It was new and curious and how could anyone expect me in good faith to administer the tablets without knowing what they would do? Without confirming how effective they truly were. Without feeling the consequences I dealt to each patient who trusted me with their life and spirit? I never imagined something other than hate could be so consuming. It has infected my mind. Shifted my priorities. I feel the call long thought banished from my heart and I don’t want to listen, but it keeps getting more insistent and I don’t just want it, I need it. I need it to make it stop. Now that Hallem knows and Atanamir knows, I can see myself through their eyes. I am not well; I know this, but still I need it and even though to them it is bad, it is dangerous, I can control it, I really can, all I have to do is change their perspective. It was the last time she would find the grips to climb to the highest rooftop of the Colagar manor. She told Pengail she needed to see something and he smiled and kissed her hand and asked if she wanted company. When she told him no, he only smiled and kissed her again — on her lips, this time — and said he’d be waiting for her return. The air was growing colder as the heat of summer burrowed deeper into the belly of the earth. The chill wind made her fingers numb, but she persisted and pulled herself up onto the rough tiles of the roof. She straightened and turned slowly. There it was. The sea. She could smell the ocean waters from there. The winds carried the scent to her and as it washed over her, she felt the weight of the world lift from her shoulders as it always did when she could connect with the sea. Perhaps Hathlafel was right. Perhaps his love of the sea passed on to her. Surely it would get easier, she thought as she sank to the roof with her knees pulled up to her chest. Force of habit made her weigh every word and analyze every flicker in his eye. And now that the poison was drawn from his wounds and he was more himself again (but not himself, she thought in tandem), the twinkle was there more often. She didn’t want to be charmed by him. She didn’t want to give him her trust like it was easy and natural. But it was, she admitted to herself as she watched the tall mainsail ease across the treetops. Perspective, she thought. Perspective changes everything. For instance, perspective made the orchards surrounding the manor a quiltwork blanket shielding the grounds from view. Perspective made the oppressive canopy a comforting blanket. Perspective made the clouds seem not so far out of reach. Perspective made Hathlafel’s behavior and half-truths justified and noble acts of love. Pengail’s words echoed in her head as the breeze picked up strength and turned into a wind. …From another perspective, that was… running away. …he is free now. To choose good. You can help him make that choice …if you wish. What did she wish for? A family. Her family. People to love and who love her back. People to protect and will protect her in turn. Pengail. Her father. What would she have done if she had been in her father’s place? If her child had been used as a pawn to control her and make her do terrible things? Would she have given in and done the bidding of that demon lady? Or would she have fought for them both and fled? OR, as they did now, fight to bring her down? She wouldn’t have been able to do it on her own. She would have needed companions that were brave and just and who understood sacrifice. Companions like the Wayfarers. Like Miss Lalaith and Sir Carmanadh. Nallo. Hallem and Mathdor. Even Atanamir and Oendir acted only out of the best interests of their friends. Her father, Hathlafel, agreed to cooperate with the Wayfarers. Agreed to testify against House Aearanel. He would only have done that if he truly believed they had the ability to stand up against Lady Gwenithel and that they could keep her safe. Unless it was all part of a deeper plot. She shook her head and realized the coolness on her cheeks was not just the evening breeze. She wiped the moisture away and let out the breath she had been holding. She didn’t want to think that way any more. Not about him. Not about her father. You can help him make that choice. The sail of the ship grew smaller as it put out to sea. More of the vessel came into view as it pulled farther away from the shore. As she watched it both grow and shrink, Arameril made a choice. Her grip was sure as she climbed back down the side of the Colagar mansion. Dusk was falling before her tentative feet finally found the sill where she liked to perch and sing while Pengail slept. Just this time she ensured her grip would stay strong as she swung into the room, and then she wouldn’t use her powers anymore. The ink would diminish and with it her strength and speed. She wouldn’t use them anymore. Once her feet were safely on the floor, she leaned out of the window and turned to look up. The roof was so far away. She felt little and weak from this perspective. She shuddered and frowned. Wrapping her arms around herself, she turned to survey the room. Her father’s book on the blankets beside Pengail as he slumbered. The hard candies and last bit of chocolate sitting on the nightstand beside the beeswax candles. Her cloak with the swan-wings for a clasp. Gifts of her father’s love. She looked out of the window facing the orchards. Once more she leaned out and looked up, only not at the roof but at the sky. The smokey blue of the evening absorbed the high clouds and the sky didn’t seem so far away anymore. I was five when I knew things were not as they seemed in my life. We were in the study and one of the girls, Romdin, bumped into a round mahogany side table. A fine porcelain vase fell to the floor. It never hit. I caught it. I never knew how, but that was what caught the attention of the Order, Deludhae told me. The swiftness of my reaction pleased her and she put me through a series of games that were really tests and I was on my path toward becoming a Rose. It was around the age of ten that I took the ink and the real learning began. The power it gives is intoxicating. The world appears different when you know the strength of your arm can bend metal and render death in the blink of an eye. But it quickly became something terrible and frightening. The control needed to blend in with the rest of the citizenry was exhausting. The secret of it ate away at the heart and was crippling. And we needed more. We always needed more to survive. Without it, we would fade away to nothing and become mere shadows of who we once were. The girls that were chosen to be Roses always had nothing else to turn to. When you owe the Lady your life, you give it. We were slaves or lacked family to protect us. If we disappeared, died, or shunned marriage no one would care enough to question it. We were forbidden to engage in relationships outside the Order to prevent such a care from forming. And only since I found you do I understand why. The strength and speed of the ink is nothing to the power I feel when I am charged with your love. I have everything to lose because I have you and you are everything. I cannot fix the pain I have caused you by keeping the truth from you. There is no time to regain your trust. Innocent people are hurting and lives are at risk because of me. I should have stood up to her long ago. Master Kemendin fears I will not return from House Aearanel. Just as you said, I have to do good, Pen, no matter the consequence. If I did not do this, there would be no way I was worthy enough to even ask for your trust. Your love. You are my conscience and my guide to redemption. Thank you. Thank you for giving the freedom of your love. I only wish I could grow old with you by my side and raise little horsemen that could jump so high they could fly and girls that could run as fast as the wind. I wish we were free to watch the stars come out each night and wake to the rosy dawn each morning and measure our lives only with our love. Pengail, I know in my heart that even if I go there to die, we will find one another again. I will always be with you. P.S. Please take care of Auriel for me. She only just found her way to me. A tiny figure in black cowered in the shadows of the corner formed by the outer walls lining Dol Amroth and the sea cliff overlooking the Keep of the Swan-knights. Even though “Faindir” had found her there the day before, she had little where else she could go. She kept back from the edge and pressed against the stone wall; surely no one would look there for her twice. On the other side of the wall, the sound of the garden patrons would set her on edge every once and a while, but most of the time only the call of the seagulls interrupted the steady rush of the ocean and clang of weapons training from the court of the Keep. Here at least she could be near the sea. Ships coasted past bearing their men to far away places, but for once her heart did not long to feel the wooden decks beneath her feet. Her eyes dwelt on doors of the keep and the bridge connecting it to the mainland. His letter was folded and tucked inside her shirt for safe keeping. She had read and reread the words a thousand times since she left his arms that morning in the Keep. He had written it before she shattered his trust with the truth, but still she repeated one line of the letter like a mantra: Perhaps soon I will be released from the infirmary and I can come to you. The plan was to meet him four days from now. She would be there in the black leathers that were all she would take with her from her past life and in the wilds she would rebuild the trust that had broken with her honesty. She would come with what she could steal or scrounge. Food. Water skins. Blankets. Though it would be a long time until the suspicion and disappointment would fade from his eyes, she trusted him. She could only hope that one day, he’d be able to trust her again. As the sun set behind the cliffs of the coast, a gleam caught her eye. She unwrapped her arms from around her legs and crawled over to the small rock cluster clinging to the cliff side. A bulky package wrapped in waxed brown paper sat wedged into a rock and had caught the last beam’s light before the sun disappeared. Frowning, she plucked off the note attached to the package. It was addressed to her and she quickly opened the attached note. I know you have no reason to trust a gift from a stranger, but when I learned of your flight from the Ivory Tower, my heart went out to you. I know all this is a poor substitute for my absence from your life, but only now with your breaking from the Mormerili is it safe for me to contact you. I’m not worried for your safety. I know you’re a clever girl and can take care of yourself. But I also know that without the protective circle of the Ivory Tower around you, you’ll need every windfall you can find. I only wish I could do more. I pray that you and I will have a chance to meet openly soon, though I know better than to think it likely. Until that day, my dear, know that you have always been precious to me, and always will be. Keep Elmeleth in your heart, and never stop hoping for better. She reread the signature. Your Father. Without smiling, she opened the package and found a new bedroll, a waterskin, a fire-starting kit, a well-made butterfly knife with a carved horn handle, and a week’s worth of hard tack rations. She turned the knife over and ran her fingers across the handle. “How…” Who could have known she had left the Order so quickly? And how could she have a father after nineteen years of not even being able to ask if she had one? Most of the girls in the Order were orphans. Slaves ‘rescued’ by Lady Gwenithel. She was just another charity case who secretly paid for her meals with blood, secrets, and lies. She had no father. But it seemed as though that was a lie, too. Very slowly, she wrapped the travel supplies back in the paper and tied the string into a perfectly even knot. She slipped the package back into the crevasse where she found it and quickly scaled the city wall for the nearest roof. She leaped without looking as she rushed for the unfamiliar trails of the forest. Her fingers and feet found their holds instinctively and soon she found herself standing on the banks of the waterfall near the stables where she and Pengail stole a morning when things were simpler. Even though Pengail had warned that there were frequent visitors to the glen she doubted any would be out so late in the evening. The black leather came off in a rush. She plunged into the water and let the falls rinse away the scents of the city. As she stood beneath the frigid cascade, she lifted her face up and screamed, the water drowning out the sound. Slowly, she sank to her knees and sat staring at the wet stones that forced the water to plunge and froth around her. She sobbed. Too many things were shifting and her paradigm could not keep up. Waterlogged and exhausted, she dragged herself out of the falls. Leaving her clothes on the banks, she crawled into the shelter of a cluster of dense brush. Sheltered from any gaze save the forest animals, she lay in the darkness until the first stars blinked to life. Only then did she pull herself up, slip back into the leathers of the Black Roses, and start the slow journey back to the city. She couldn’t leave just yet.